Los Angeles Nov 29, 2017 – The all-new 2018 Jeep® Wrangler – the most capable and recognized vehicle in the world – builds on its legendary history with an unmatched combination of off-road capability, authentic Jeep design, open-air freedom, advanced fuel-efficient powertrains, superior on- and off-road dynamics, and a host of innovative safety and advanced technology features. Los Angeles Nov 29, 2017 – The all-new 2018 Jeep® Wrangler features a sculptural design aesthetic that’s bold and functional, with a wide stance and trapezoidal wheel flares. Wrangler’s wide, muscular stance stays true to the original design while providing a fresh, modern take on an iconic profile. The all-new 2018 Jeep Wrangler builds on a sculptural design aesthetic that is immediately recognizable as the icon of the brand with its traditional Jeep design cues. The Wrangler’s new exterior design is bold and rugged with a wide stance and lowered beltline with bigger windows for better outward visibility, especially out on the trails. A robust roofline and muscular fenders create an unmistakably Jeep profile. Two-piece body-color fender flares with a black lower insert give a raised profile, and are standard on Sahara and available on Rubicon models. 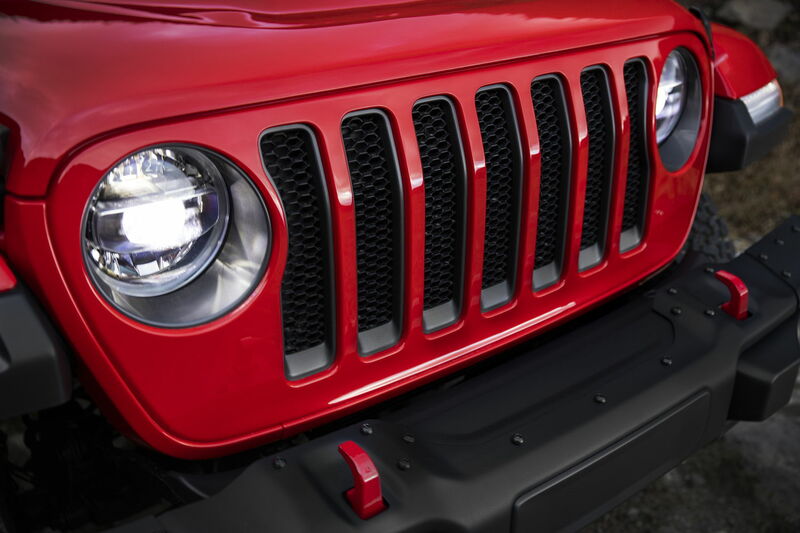 Jeep’s design team gave the legendary seven-slot grille an updated look that now shows both outer grille slats intersecting with the headlights, paying homage to the Jeep CJ. The top of the keystone-shaped grille has been gently swept back for improved aerodynamics. The 2018 Jeep Wrangler features a traditional clamshell hood with new distinctive hood latches, while the dual-vented Power Dome hood is standard on Rubicon models. The windshield’s rake has been optimized for improved aerodynamics and features a new four-bolt design at the top of the windshield to fold down quickly and easily. All Wrangler models feature a new rubber windshield bumper design, which incorporates the footmen’s loop, windshield washer nozzle and hood bumpers into one part. A new header bar now connects the A-pillars and stays in place even when the windshield is folded down. This allows the rearview mirror to remain in place with the windshield folded. New lightweight, high-strength aluminum doors combined with door pins that are staggered lengths allow for ease of installation and removal. The Torx bit tool size is now stamped directly onto the aluminum door hinge to eliminate guessing which tool size is needed to remove the doors. A new half-door design will be available starting in 2019. A new aluminum and magnesium swing gate gives way to a wider opening, making it easier to load bulky objects. A stamped metal information plaque adorns the inside of the swing gate and is reminiscent of those on the original Jeep Willys. The rear license plate holder now sits on the rear bumper to accommodate the spare tire, which has been lowered to enhance rearward visibility. An integrated spoiler combined with rounded roof edges helps air pass over the vehicle. The rear wiper has also been relocated to the bottom of the glass to enhance rearward visibility. Available LED headlamps and fog lamps on Sahara and Rubicon models offer crisp white lighting and add to the Wrangler’s distinctive look. The forward turn signals – standard LEDs on Sahara and Rubicon – are positioned on the front of the trapezoid wheel flares, while the daytime running lights now form a halo around the outside perimeter of the headlights. From behind, traditional square tail lamps feature available LED lighting on Sahara and Rubicon models. The short front and rear overhangs, and available steel bumpers with removable end caps, enable an unrivaled approach angle, which helps give Wrangler its legendary capability. As the only true open-air 4×4 SUV on the market, Wrangler continues to offer a variety of top options, including an all-new Sky One-Touch powertop, available on Sahara and Rubicon 4-door models, which is easy to use and strengthens Wrangler’s promise of utility and adventure by allowing occupants to retract the full-length open canvas roof with a push of a button. The rear quarter windows are removable for even more open-air freedom. An all-new premium Sunrider soft top, available on all Wrangler models, has been improved and provides an easy open-air option that quiets road noise. The new soft top relies on clock springs to help quickly raise and lower the top. Wrangler Sahara and Rubicon models share a body-color hardtop option, offering a unique, premium appearance, while a black three-piece hardtop, available on all Wrangler models, offers even more options for open-air driving. Integrated gutter rails above the doors and a rear cargo window enable the simple installation of a roof rack system. Customers have the choice of seven available wheel designs in sizes ranging from 17 to 18 inches. The new 2018 Jeep Wrangler will have 10 exterior colors from which to choose: Black, Bright White, Firecracker Red, Granite Crystal Metallic, Hella Yella, Ocean Blue Metallic, Punk ’n Metallic, Sting-Gray, Mojito! and Billet Silver Metallic. The classic round headlights, trapezoidal two-piece wheel flares, removable doors, new half doors, exposed hinges now with the Torx bit tool number stamped into the hinge, fold-down windshield, innovative removable hard and soft tops and an all-new Sky One-Touch powertop allow Wrangler to retain the brand’s iconic appearance and function. With room for five adults, Jeep Wrangler remains the only four-door 4×4 open-air vehicle on the market. The center console integrates the functional features of the Wrangler, including gear shift selection, transfer case and parking brake. The center stack houses climate and volume control knobs, media charging and connectivity ports and Engine Stop-Start (ESS) control – all easily within reach of the front occupants. Real bolts on the shifter and grab handle celebrate genuine construction methods. The grippy Commando over-mold texture wraps the redesigned instrument panel grab handle and the 8.4-inch Uconnect touchscreen frame. A push-button starter, featuring a weather-proof surround, makes its debut on the 2018 Wrangler as standard equipment, and is easily located within the driver’s reach. Painted mid-bolster panels compliment the horizontal dashboard layout and features colors and finishes dictated by the model choice. Sport models feature Satin Silver panels, while Sahara models feature Grillz Silver or an optional premium leather-wrapped dashboard. HVAC vents are surrounded by Platinum Chrome plated bezels for a precise and premium appearance. Standard cloth or optional leather-contoured seats with contrasting stitching feature adjustable bolster and lumbar support. The rear seat’s angle has been improved to optimize rear occupant comfort. The driver and front passenger soft-molded door trim panels are soft to the touch and feature lengthened armrests for additional comfort. New Lift-Assist handles under each door armrest feature an integrated pull-cup design that makes door removal quicker and easier than ever. Convenience features include passive entry with Keyless Go. A 7- or available 8.4-inch touchscreen houses the fourth-generation Uconnect system and now sits prominently atop the center stack. A 5-inch touchscreen is standard on Wrangler Sport. Directly below the touchscreen are functional features such as climate and volume control knobs and media connectivity ports. The instrument display cluster features a 3.5- or 7-inch thin-film transistor (TFT) information LED display. The 7-inch configurable LED display allows the driver to configure displayed information, such as current media being played, tire-pressure monitoring, or digital speed readout. Integrated buttons on the steering wheel control audio, voice, and speed functions, and allow the driver to keep their hands on the wheel. Wrangler Sahara and Rubicon models now feature a telescope/tilt steering wheel function. There are two USB ports up front and two in reach of occupants in the back seat that connect to the media center. Standard 12-volt accessory outlets are located throughout the Wrangler, and a 115-volt AC outlet is available to power select three-pronged home electronics. Clever storage solutions are found throughout the 2018 Wrangler, including durable mesh pockets that extend the entire length of the doors and numerous phone storage areas. In the rear cargo area, the available subwoofer is now located on the right side and an under-floor storage area behind the rear seat provides room to secure small items out of sight. The glove box is now damped and like the center console, can be locked to safely secure valuables when the top is down. The available all-new Trail Rail cargo management system allows easy access to the contents in the cargo area and provides additional storage options to organize and secure cargo. The three available color interior palettes in the new 2018 Jeep Wrangler were inspired by active lifestyle adventures around the world. Mountainous terrain inspired the Wrangler Sport’s interior. The Peak embossed fabric shows off a toughness and edge representative to what a Wrangler is. The choice of a Black McKinley or Heritage Tan interior with tonal accent stitching is indicative of the adventurous environment that is to come. The Platinum Silver mid-bolster, along with the unique Anodized Carbon bezel rings, top off Wrangler Sport’s interior. The premium interior found in Wrangler Sahara models features Black McKinley leather, wrapped Monaco vinyl and topstitched with Light Tungsten accent stitching, and Platinum Chrome bezels. The unique Grillz paint on the mid-bolster sets the tone for the two-tone Heritage Tan and Black McKinley leather interior with Light Tungsten stitching. Like the Sport, Sahara models also feature Peak embossed fabric that demonstrates a toughness synonymous with Wrangler. The 2018 Jeep Wrangler Rubicon features an exclusive interior and is available with cloth or leather seating. The Rubicon interior features Maddox fabric cloth seats embossed with a honeycomb pattern and Ruby Red accent stitching. Both leather or cloth seats feature an embossed “Rubicon” logo on the seat back and red mesh side storage pockets featured on the bottom of the doors. “Redicial Red” paint on the dashboard’s mid-bolster and stitching on the seats, center armrest, door armrests, leather steering wheel, shifter sleeves, bezels, and dashboard add a burst of color to the interior. Like the Sahara, Rubicon models also feature the eye-catching Platinum Chrome bezels. Los Angeles Nov 29, 2017 – The all-new 2018 Jeep® Wrangler receives a multitude of enhancements versus its predecessor to optimize the ride, handling and sound characteristics while reducing weight and improving fuel economy. Utilizing a body-on-frame design and featuring a five-link suspension system, Wrangler delivers even more capability, with improved on-road driving dynamics, ride comfort and passenger safety. The new 2018 Jeep Wrangler’s body-on-frame design is bolstered by eight body mounts on two-door models and 10 on the four-door. A fully boxed frame utilizes high-strength steel in all critical areas and hydroformed sections of the front rails set a strong foundation to better handle the front suspension load. Galvanized frame components are utilized for improved corrosion protection. In total, five boxed cross members are used on Wrangler. To protect critical components while on the trail, including the fuel tank, transfer case and automatic transmission oil pan, Wrangler employs four skid plates and bars. Rubicon models benefit from the use of heavy gauge tubular steel rock rails to curtail potential body damage inflicted while out on the trail. New for 2018, a header bar now connects the A-pillars and stays in place even when the windshield is folded down. This allows the rearview mirror to remain in place with the windshield folded. The use of lightweight, high-strength aluminum closures, including the doors, door hinges, hood, fender flares and magnesium swing gate help reduce weight and boost fuel economy. Other ways the Jeep engineering team looked to reduce weight included using hollow track and stabilizer bars, aluminum engine mounts and steering gear, and a larger, lighter master cylinder. For 2018, Wrangler continues to utilize the proven five-link coil suspension configuration. Wrangler’s front suspension features a lateral control arm and four longitudinal control arms. Full width track bars made of forged steel control lateral movement of the axle with minimal angle change during suspension travel. The roll center height has been raised and the spring rates retuned to provide a comfortable ride when traveling around town. The five-link rear suspension features two upper and two lower forged steel control arms for longitudinal control and a track bar for lateral axle control. The fuel tank is positioned in a central location and the control arms are located outside of the frame rails. The rear shocks are splayed (angled inboard at the top) to provide consistent damping. The shocks have been retuned and demonstrate optimum balance between on-road handling and legendary off-road capability. Ride comfort, body roll control and handling is significantly improved with new shock tuning, hard points and body mount strategy. On Wrangler Rubicon models, an electronic front sway bar disconnect is featured to provide additional wheel travel when the terrain calls for it. An industry-leading approach angle of 44 degrees, breakover angle of 27.8 degrees, departure angle of 37 degrees and a ground clearance of 10.9 inches allows Wrangler to go anywhere. Wrangler also benefits from up to 30 inches of water fording and up to 3,500 pounds of towing capacity with the available towing package. All Wrangler models now feature electro-hydraulic power steering to deliver a more natural steering feel and improved fuel economy. The steering system’s pump draws power from an electric motor that activates when it senses driver input and applies a variable amount of torque to assist the driver while steering. The electric motor works with an adaptive engine control unit (ECU) to monitor steering speed, steering wheel angle and vehicle speed. This allows for variable amounts of steering assistance to be applied, for example, when more is needed at low speeds maneuvering through a parking lot, or less when at highway speeds to enhance vehicle stability. Wrangler’s steering knuckles face outward into the wheel envelopes and reduce scrub radius. This allows for improved steering stability while braking and enhances steering input, including bump steer when going over uneven surfaces. The roll center height has been raised on Wrangler and overall turning radius improved. Curb-to-curb turning circle is a snug 34.5 feet on Wrangler and 40.8 feet on Wrangler four-door models. Both Wrangler two-door and four-door models feature electro-hydraulic power steering as standard equipment with a steering ratio of 17.4:1 for two-door models and 15.6:1 for the four-door. Wrangler’s steering wheel can go from lock-to-lock in 3.5 turns for two-door models and 3.2 turns for four-door models. The all-new 2018 Wrangler features larger brakes to improve stopping power when compared to the outgoing model. Stopping distance, brake noise, pedal feel and rotor life have all been improved as a result. A larger, lighter master cylinder, new full-time electric vacuum pump and redesigned pedals are also utilized to optimize braking performance. Wrangler Sport models now feature 12.9 inch x .94 inch vented rotors while Sahara and Rubicon models use 12.9 inch x 1.1 inch vented rotors. Wrangler Sport features 1.9-inch twin piston, floating calipers up front and 1.8-inch single piston, floating calipers in back. Wrangler Sahara and Rubicon models feature two-inch twin piston, floating calipers in front and 1.9-inch single piston, floating calipers in the rear. The total swept front brake area on all Wrangler models is 75 square inches. In back, Wrangler Sport models feature 12.9 inch x .47-inch rotors with cast iron, floating calipers while Sahara and Rubicon models use 13.4 inch x .55 inch rotors with cast iron, floating calipers. Total swept area for the rear brakes is 62 square inches on Sport and Sahara models and 66.8 square inches on Rubicon. All Wrangler models features a parking brake with a drum-in-hat design. As part of Jeep’s commitment to safety, four-wheel disc brakes and electronic stability control (ESC) are standard. The ESC system works with the anti-lock brake system (ABS) and includes sensors on all four wheels that are all monitored for wheel slip, particularly when deteriorating conditions in snow, ice, mud and wet pavement arise. 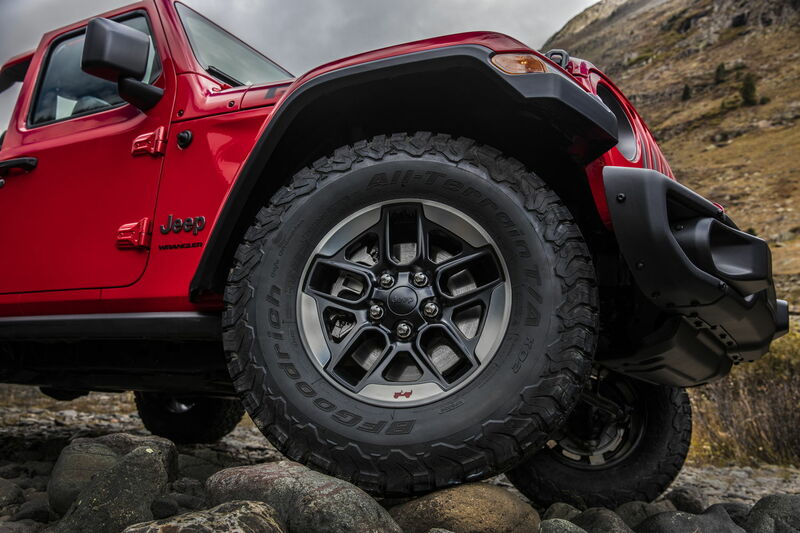 If the system detects wheel slip, the brakes are applied to assist in keeping Wrangler on its desired path. Other systems that work under ESC include electronic roll mitigation, which uses sensors positioned at the center of the vehicle to detect yaw and apply the brakes when needed, and trailer-sway control, which reduces trailer sway and bolsters vehicle handling when demanding conditions, such as crosswinds, are detected. Brake traction control monitors and reduces wheel spin during hard acceleration from a stop or at low speeds in low traction situations by applying the brake to the wheel(s) that is slipping. Jeep engineers optimized the 2018 Wrangler’s structural design through the powertrain mounting system to isolate powertrain, wind and road noise. Both the 3.6-liter Pentastar V-6 and all-new 2.0-liter inline four-cylinder engine’s noise are hardly noticeable while idling. On the 3.6-liter V-6, all necessary accessories are mounted right to the engine without the use of excess brackets. This allows all accessories, including the air conditioner compressor and alternator, to be anchored firmly, and are impermeable to vibration and noise. This clever design allows the 2018 Jeep Wrangler to boast improved interior sound quality. The all-new Wrangler has undergone more than 3.9 million miles of testing – one of the highest totals ever for any FCA US vehicle. Extreme-weather testing occurred in various environments, including the scorching Arizona heat and blistering cold of Alaska, for weeks at a time. Wrangler was also subjected to global test miles in areas such as China, Brazil, India, Australasia and Italy. In addition to all laboratory and standardized tests, the all-new Wrangler traversed Northern Michigan mud and the Rubicon Trail. Los Angeles Nov 29, 2017 – The all-new Jeep® Wrangler will offer two different gasoline engines, one diesel engine and four different powertrain combinations. A 3.0-liter V-6 EcoDiesel engine will be available on Wrangler 4-door models starting in 2019. The all-new 2.0-liter turbocharged inline four-cylinder engine with eTorque technology is optional while the proven, fuel-efficient 3.6-liter Pentastar V-6 engine is standard with Engine Stop-Start (ESS). The icon of the Jeep brand, the new 2018 Wrangler, is the most capable sport-utility vehicle (SUV) ever, with two advanced available driveline systems offering unmatched capability no matter the conditions. Wrangler Sport and Sahara models are equipped with the Command-Trac 4×4 system, featuring a part-time, two-speed transfer case with a 2.72:1 low-range gear ratio. Rubicon models are equipped with the Rock-Trac 4×4 system, featuring a two-speed transfer case with a 4:1 low-range gear ratio, front and rear next-generation Dana 44 axles, Tru-Lok electric front- and rear-axle lockers, and electronic sway bar disconnect. A new Selec-Trac two-speed transfer case with full-time four-wheel-drive (4WD) mode available on the Sahara model offers continuous power to the front and rear axles and is easy to use. Available Trac-Lok limited-slip rear differential provides extra torque and grip during slippery, low-traction situations, such as driving over sand, gravel, snow or ice. The Command-Trac 4×4 system with the NV241 transfer case helps get through any off-road obstruction and any weather condition. This 4×4 system can be engaged even while in motion – up to speeds of 55 miles per hour (mph) and features a 2.72:1 low range for rock crawling, and has the ability to be flat towed while in neutral. Wrangler Sport and Sahara models equipped with the standard six-speed manual transmission benefit from a 48.18:1 crawl ratio, while Sport and Sahara models with the eight-speed automatic transmission feature a 44.20:1 crawl ratio. Standard on Wrangler Rubicon models, the Rock-Trac 4×4 system with an enhanced NV241 OR transfer case offers even more capability and a 4:1 low gear ratio. Wrangler Rubicon’s off-road prowess is bolstered by all-new Tru-Lok electronic locking differentials and an electronic front sway-bar disconnect. Wrangler Rubicon models equipped with the standard six-speed manual transmission boast an 84.2:1 crawl ratio. Rubicon models with the eight-speed automatic transmission feature a 77.2:1 crawl ratio. For the first time in Wrangler’s history, a Selec-Trac two-speed transfer case with full-time 4WD and a low range is available on Sahara models. This new full-time two-speed transfer case is intuitive and allows the driver to set it and forget it while constantly sending power to the front and rear axles. Three different engines – two gasoline and one diesel – will be available, while an all-new standard six-speed manual transmission and new optional eight-speed automatic transmission are available. The proven, fuel-efficient 3.6-liter Pentastar V-6 engine is standard with ESS. The all-new 2.0-liter turbocharged inline four-cylinder engine with eTorque technology is rated a best-in-class 270 horsepower and 295 lb.-ft. of torque and mated to a new eight-speed automatic transmission. The 2.0-liter turbocharged inline four-cylinder engine’s torque output surpasses that of the V-6 engine offered in Wrangler. An all-new eTorque system improves fuel economy, launch performance and driver comfort during start/stop operations. The 2.0-liter turbocharged I-4 engine is part of the Global Medium Engine architecture family and features Double Over Head Camshafts (DOHC), dual independent camshaft timing and a cooled exhaust gas recirculation (C-EGR) system. This is the first time that the combined use of a twin-scroll turbocharger, C-EGR system, Central Direct Injection and the independent liquid cooling intake of air, throttle body and turbo have been employed together. This combination of technologies enables the high levels of performance and reduces fuel consumption. Direct injection, coupled with turbocharging, enables more efficient combustion and increased performance. The 2.0-liter I-4 engine’s fuel pump supplies the engine’s 2,900-psi high-pressure common-rail injection system. These high pressures produce better fuel atomization and allow for more precise fuel delivery than port fuel-injected systems, which in turn improves both performance and efficiency. A variable displacement two-stage oil pump provides high oil pressure under high speed and load, but switches to a low-pressure mode for improved fuel economy during typical driving conditions. The piston cooling jet operation is managed by the two-stage oil pump to enhance fuel economy under normal driving conditions while improving durability under demanding, high-load engine operation. A large capacity oil cooler extends the oil change interval and ensures engine durability. The cast aluminum alloy cylinder head features a central injector and high tumble intake ports. This combination provides increased charge motion and balanced airflow for improved fuel efficiency and performance. Cast-aluminum pistons with a 10:1 compression ratio have four valve pockets to accommodate the dual Variable Valve Timing (VVT) system. Each cylinder bore is fitted with gallery-mounted piston oil squirters to limit piston temperatures, reduce spark knock and increase piston durability. 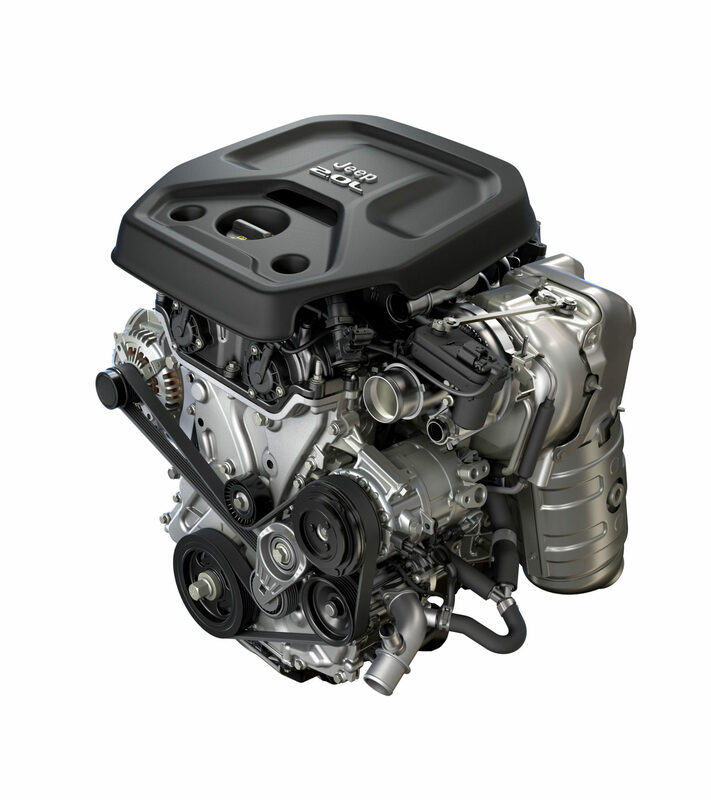 The 2.0-liter I-4 engine features a low-pressure, sand cast-aluminum block with cast-in iron liners. The bore diameter is 84 mm and the stroke is 90 mm. Total displacement is 1,995 cc. A water-cooled, integrated exhaust manifold helps reduce turbo inlet temperatures while providing increased engine reliability. An inverted tooth primary chain drives both the intake and exhaust camshafts and minimizes noise. Camshafts are robotically assembled using hollow shafts and have polished cam journals to reduce weight and improve durability for start-stop engine operation. The use of hollow shafts provides a 3.5 lbs. weight reduction when compared to an equivalent solid shaft. Select-fit main and rod bearings enable reduced clearances to help lower system oil demand and oil pumping effort. In addition, floating piston pins utilize Diamond Like Coating (DLC) for reduced friction. The ignition system includes a high-energy ignition coil for better fuel efficiency and precious-metal spark plugs with iridium and platinum provide lasting durability. Located in the center of the cam cover, the spark plugs are easily accessible when service is required. Sodium-filled exhaust valves and plasma-coated piston rings also help extend the engine’s life and bolster durability. Engineered to provide a broad torque band with a focus on low-end torque, the 3.6-liter Pentastar V-6 engine is rated at 285 horsepower and 260 lb.-ft. of torque. ESS is now standard on all Wrangler models equipped with the 3.6-liter Pentastar V-6 engine. An all-new six-speed manual transmission is standard on all Wrangler models equipped with the 3.6-liter Pentastar V-6, and a new eight-speed automatic transmission is optional. Known for its refinement, power, efficiency and adaptability, there are more than 5 million 3.6-liter V-6 Pentastar engines on the road today. The 2018 Jeep Wrangler benefits from the popular V-6 engine’s low-range torque, which is needed when out on the trails or whenever the conditions call for it. The 3.6-liter Pentastar V-6 engine employs a two-step variable-valve lift (VVL) cooled exhaust-gas circulation (EGR) and innovative weight-reduction strategies that boost the engine’s efficiency and performance. The system is designed to remain mostly in low-lift mode until the customer demands more power, then it responds by switching to high-lift mode for improved combustion. The result is less overall pumping work, which on its own, helps improve fuel economy. ESS, which is now standard equipment on all 3.6-liter Pentastar V-6 engines in Wrangler, is driven by a high-speed and high-durability starter, which reduces crank time for quicker restarts. With ESS, acceleration is always aligned with driver inputs. Passive accelerator application is met with measured throttle response; hard inputs trigger aggressive starts. There’s no waiting for either. If the driver chooses to forgo the benefits of ESS, the feature can be deactivated with the push of a button, then reactivated when the vehicle is restarted via the push button starter. The 3.0-liter EcoDiesel engine will be available starting in 2019. Wrangler four-door models will offer a 3.0-liter EcoDiesel V-6 engine, rated at 260 horsepower and 442 lb.-ft. or torque, with ESS standard. A new eight-speed automatic transmission is standard and was designed to handle an increased torque output. The EcoDiesel V-6 engine implements new turbocharger technology with a low-friction bearing designed for low end and transient performance. The third-generation EcoDiesel V-6 engine also features low-friction pistons to improve fuel economy and reduce greenhouse gas emissions and an enhanced combustion system – new injector nozzle, piston bowl and glow plug with integrated combustion pressure sensor to optimize combustion. The EcoDiesel’s fuel pump supplies the engine’s 2,000-bar (29,000-psi) high-pressure common-rail injection system. The engine also benefits from MultiJet 2 technology, which enables Injection Rate-Shaping – fuel injection that is modulated to mitigate noise and improve low-speed throttle response, while reducing fuel consumption. The system’s high-dispersion nozzles and advanced-technology servovalve can accommodate up to seven fuel-injection events per cylinder cycle. The new 2018 Jeep Wrangler offers the FCA US-manufactured TorqueFlite eight-speed automatic transmission, enabling the vehicle to optimize engine output while on the trails or enjoying smooth, efficient power delivery at highway speeds. The eight-speed automatic is available on all Jeep Wrangler models. Wrangler four-door models equipped with the 3.0-liter V-6 EcoDiesel engine utilizes an even more robust version of the eight-speed automatic transmission to handle the elevated torque output. As in other FCA US vehicles, the Wrangler’s eight-speed automatic transmission offers a responsive driving experience. Whether commuting during the week or rock crawling on the weekend, customers will enjoy a smooth, linear power delivery and improved fuel efficiency. The fully electronic, eight-speed automatic transmission features the on-the-fly shift-map changing with Auto Stick manual shift capability. The sophisticated transmission software relies on many input parameters to determine the appropriate driving conditions and adjusts shift pattern in response to these driving conditions to offer the best possible fuel economy and drivability balance. The result is automatic shifting ideally attuned to the performance requirements of almost any driving demand. The transmission’s gear ratios afford the right response at the right time, from crawling over obstructions on the trail to smooth power delivery at highway speeds, a product of smaller ratio steps between the gears. The Jeep Wrangler’s eight-speed automatic transmission provides a more responsive driving experience with quicker acceleration and smoother shifting. The wide ratio spread delivers an aggressive first gear ratio of 4.71 for low-end performance and small gear ratio steps provide smooth transitions from gear-to-gear. However, a Jeep SUV isn’t a Jeep SUV unless it delivers superior off-road performance. Uniquely suited to the requirements of the Wrangler Rubicon model, the eight-speed automatic transmission delivers a 77.2:1 crawl ratio setting. The improved 4×4 performance benefits from a 4.71 first-gear ratio coupled with a 4.1:1 final drive to deliver unmatched capability. New 2018 Jeep Wrangler models are equipped with the standard six-speed manual transmission. This transmission features a unique design that features new gear ratios for improved crawl ratio performance, a new gear pattern, and a cable-operated shift design that eliminates movement and improves sound isolation. The revised shift pattern now features improved shift accuracy, a more comfortable shifting position and 50 percent shorter shifter throws than that of the outgoing Wrangler model. Los Angeles Nov 29, 2017 – Safety and security were paramount in the development of the all-new 2018 Jeep® Wrangler, which offers more than 75 available active and passive safety and security features. Available features include: Blind-spot Monitoring and Rear Cross Path detection, ParkView rear backup camera with dynamic grid lines, electronic stability control (ESC) with electronic roll mitigation and four standard air bags. Los Angeles Nov 29, 2017 – The all-new 2018 Jeep® Wrangler offers three new Uconnect systems, delivering communication, entertainment and navigation features drivers and passengers desire, including a full-color LED instrument cluster. This marks the first-time Wrangler offers the new, fourth-generation Uconnect systems. The all-new 2018 Jeep Wrangler debuts with the fourth-generation Uconnect system that includes easy-to-use features, enhanced processing power, faster start-up times and a touchscreen that displays high-resolution graphics. The Uconnect 4C NAV offers built-in navigation standard, including 3-D imagery of landmarks, city models and digital terrain. Utilizing the large, 8.4-inch touchscreen, the Uconnect Navigation system delivers directions, lane guidance and points of interest. The touchscreen supports multi-touch gestures with pinch, tap and swipe capability. The all-new system features enhanced graphics and a one-step voice entry system so Jeep customers can easily say the address and navigate on the go. SiriusXM Traffic works with the vehicle’s navigation system to display traffic speed and flow information, along with accident information to assist drivers in routing around congested areas. The new 2018 Jeep Wrangler offers its customers an expanded channel lineup from SiriusXM Radio with new exclusive programming. The Uconnect 4C NAV system offers available 4G LTE Wi-Fi Hotspot connectivity, with different data plan options, including an unlimited data plan. For the 2018 Jeep Wrangler, filling the instrument cluster in front of the driver is the standard 3.5-inch driver information display. Fuel gauge and digital temperature display are strategically placed for easy reference while driving, and the crisp display is easily customizable to display preset information of the driver’s choice. The reconfigurable 3.5-inch driver information display screen can be customized by the driver by scrolling through menus using the steering-wheel-mounted controls. Available menus include: speedometer, vehicle information, fuel economy, trip information, audio, stored messages, screen setup and settings, and turn-by-turn navigation, if the vehicle is equipped with navigation. A class-leading 7-inch full-color driver information display is available on 2018 Jeep Wrangler models. Featuring a reconfigurable function that enables drivers to personalize information inside the instrument cluster, the display is designed to visually communicate information, using graphics and text, quickly and easily. The driver information display offers drivers a wide range of customization options, from a basic speed readout to specific vehicle status information. Operation of the display is clearly communicated to users with easy-to-understand icons and instructions. Using buttons on the steering wheel, drivers can customize the screen with as much or as little information as they desire. The system is intuitive and can be arranged for a variety of views. Additionally, the four corners of the display can be customized to show information at a glance, including current fuel economy, outside temperature, time and compass direction. Once a main screen is chosen, it becomes the default setting, remembering the user’s selection upon restarting the Wrangler. Vehicle concerns are instantly reported to the driver via pop-up warning messages on the display. Text warning messages are automatically stored so a driver can review the message at their convenience. Los Angeles Nov 29, 2017 – Mopar is introducing more than 200 new Jeep® Performance Parts and accessories, created or redesigned through more than 100,000 hours of factory-backed development, for owners to personalize the all-new 2018 Jeep Wrangler for any adventure or lifestyle. New Mopar products will be available at the launch of the all-new Wrangler in dealerships in January. New Mopar products for the most capable SUV ever include Jeep Performance Parts lifts kits, beadlock-capable wheels, off-road bumpers, LED off-road lights and rock rails. First-ever Mopar accessories for the Wrangler include a roof rack for mounting a variety of lifestyle cargo carriers and a tailgate table compatible with the production Trail Rail storage system of the all-new Wrangler. All-new Jeep Wrangler owners who are serious about off-roading can choose from new additions to the Mopar brand’s line of Jeep Performance Parts. New Jeep Performance Parts LED off-road lights, available in 5- and 7-inch applications, pump out a maximum of 8,000 lumens, putting commercial and military grade illumination into the hands of hard-core off-roaders. The off-road lights mount to the frame rails, winch guard or windshield via new Jeep Performance Parts off-road light brackets. A new auxiliary switch bank, featuring its own power distribution center offers an organized central area for operating accessories, such as the off-road lights, winch and other electrical-powered items. New, unique Jeep Performance Parts rock rails are thicker and wider to protect the sculptural exterior, and feature the same coating used on Ram Truck bedliners to add a non-slip finish. A Wrangler Rubicon off-road bumper guards the modern and renowned Wrangler profile, maintaining factory standards and properly harmonizing with the design aesthetics of the new Wrangler. The Mopar roof rack is offered for the first time on the all-new Wrangler. Lifestyle cargo carriers, including a ski, snowboard and bicycle carrier, mount to the roof rack to assist in transporting gear and recreational equipment. Also new is the Mopar tailgate table, which can be mounted to the new production Trail Rail storage system. The steel tailgate table opens out to create a utility space and beverage holder, and folds up for storage. Other options for the Trail Rail system include the new Mopar emergency first aid kit, improved to include individual pockets for kit contents, and a roadside assistance kit. New Mopar accessories available for Wrangler include mesh and solid bikini tops, fitting the vehicle’s open-air, fun-and-freedom character while delivering protection from the sun when the hardtop is removed. New screen protectors, a first from Mopar for any vehicle, block dust and debris from cluttering Uconnect 7- and 8.4-inch display systems and even help to enhance visibility. A few of the many additional Mopar accessories available include vehicle graphics, tire covers in a variety of style and designs, all-weather floor mats, molded cargo trays, grab handles and fuel doors. The Mopar brand’s line of Jeep Performance Parts and accessories for the all-new Wrangler was developed in close conjunction with the Jeep brand and product design office — more than 100,000 hours was spent on development, testing and validation before bringing the parts to market. The strictest standards and factory-exclusive data — information not available to the aftermarket — were used to seamlessly integrate Mopar parts and accessories with the all-new Wrangler and deliver proper fit, finish and quality down to the color, grain, look and line of each product. The Mopar line of Jeep Performance Parts and accessories for the all-new 2018 Jeep Wrangler will be available for purchase when the Wrangler arrives in dealerships in January. Jeep Performance Parts for the all-new 2018 Jeep Wrangler can be purchased at FCA US LLC dealerships, with Mopar accessories available at dealerships or online. For information, visit www.mopar.com/jpp. At first, Willys-Overland and American Bantam Car Manufacturing Company were the only two companies answering the call. Soon, however, Ford Motor Company entered the picture, and competition began among the three over which company would receive the lucrative government contract. Each company produced prototypes for testing in record time. Bantam’s chief engineer, along with a team of Bantam executives, worked out a design, and the company built its field car within 49 days. Willys-Overland Vice President of Engineering Delmar G. Roos designed the Willys Quad. Ford developed its Model GP (General Purpose), known as the Pygmy, which was powered by an adapted Ford/Ferguson tractor. Each company delivered its prototype to the Army in the summer of 1940 and received approval to build 70 sample vehicles. The Army took possession of the vehicles in November 1940 at Camp Holabird, Maryland. Each of the three designs exceeded the Army’s specification of 1,300 pounds, but the Army soon realized that limit was far too low and raised it for the next round of vehicles. The Army issued the next round of contracts in March 1941. Bantam was to produce 1,500 Model 40 BRC vehicles, Ford would build 1,500 modified and improved GP Pygmy vehicles and Willys-Overland would build 1,500 Quads. Further testing and evaluation led to the Army’s selection of Willys-Overland as the primary manufacturer. With modifications and improvements, the Willys Quad became the MA, and later the MB. But the Army, and the world, came to know it as the Jeep®. Some claimed that the name came from the slurring of the letters “GP,” the military abbreviation for “General Purpose.” Others say the vehicle was named for a popular character named “Eugene the Jeep” in the Popeye cartoon strip. Whatever its origin, the name entered in American lexicon. The Willys MA featured a gearshift on the steering column, low side body cutouts, two circular instrument clusters on the dashboard and a hand brake on the left side. Willys struggled to reduce the weight to the new Army specification of 2,160 pounds. Items removed for the MA to reach that goal were reinstalled on the next-generation MB, resulting in a final weight of approximately 400 lbs. above the specifications. Willys-Overland would build more than 368,000 vehicles, and Ford, under license, some 277,000, for the U.S. Army. The rugged, reliable olive-drab vehicle would forever be known for helping win a world war. Willys trademarked the “Jeep” name after the war and planned to turn the vehicle into an off-road utility vehicle for the farm – the civilian “Universal Jeep.” One of Willys’ slogans at the time was, “The Sun Never Sets on the Mighty Jeep,” and the company set about making sure the world recognized Willys as the creator of the vehicle. The first civilian Jeep vehicle, the CJ-2A, was produced in 1945. It came with a tailgate, side-mounted spare tire, larger headlights, an external fuel cap and many more items not included in the military predecessors. Several CJ-2A features, such as a 134-cubic-inch I-4 engine, a T-90A transmission, Spicer 18 transfer case and a full-floating Dana 25 front and Dana 23-2 rear axle, were found on numerous Jeep vehicles in future years. The CJ-2A was produced for four years. Introduced in 1948, the CJ-3A was very similar to the previous model, but featured a one-piece windscreen and a more robust rear axle, and retained the original L-head four-cylinder engine. The CJ Model was updated in 1953, becoming the CJ-3B. It had a taller front grille and hood than its military predecessor in order to accommodate the new Hurricane F-Head four-cylinder engine. The CJ-3B remained in production until 1968 and a total of 155,494 were manufactured in the U.S. In 1953, Willys-Overland was sold to Henry J. Kaiser for $60 million. The Kaiser Company began an extensive research and development program that would broaden the Jeep product range. In 1955, Kaiser introduced the CJ-5, based on the 1951 Korean War M-38A1, with its rounded front-fender design. It was slightly larger than the CJ-3B, as it featured an increased wheelbase and overall length. Improvements in engines, axles, transmissions and seating comfort made the CJ-5 an ideal vehicle for the public’s growing interest in off-road vehicles. The CJ-5 featured softer styling lines, including rounded body contours. With an 81-inch wheelbase, more than 600,000 CJ-5s were produced over 30 years. A long-wheelbase (20 inches longer than the CJ-5) model was introduced and known as CJ-6. Apart from a longer wheelbase, the CJ-6 was almost identical to the CJ-5, but with more cargo space. Jeep also introduced a forward-control cab-over-engine variation to the CJ line in 1956. American Motors Corporation (AMC) equipped both the CJ-5 and CJ-6 with heavier axles, bigger brakes and a wider track. In 1965, a new “Dauntless” V-6 engine was introduced as an option on both the 81-inch wheelbase CJ-5 and 101-inch wheelbase CJ-6. The 155-horsepower engine almost doubled the horsepower of the standard four-cylinder engine. It was the first time a Jeep CJ could be equipped with a V-6. Beginning in 1973, all Jeep CJs came equipped with AMC-built 304- or 360-cubic-inch V-8 engines. In 1976, AMC introduced the CJ-7, the first major change in Jeep design in 20 years. The CJ-7 had a slightly longer wheelbase than the CJ-5 to allow space for an automatic transmission. For the first time, the CJ-7 offered an optional molded plastic top and steel doors. Both the 93.5-inch wheelbase CJ-7 and 83.5-inch wheelbase CJ-5 models were built until 1983, when demand for the CJ-7 left AMC no choice but to discontinue the CJ-5, after a 30-year production run. Introduced in 1981, the Scrambler was a Jeep similar to the CJ-7, but with a longer wheelbase. Known internationally as the CJ-8, it was available in either a hardtop or soft-top version. Less than 30,000 Scramblers were built – and are extremely popular among collectors today. In 1983, the growing market for compact four-wheel-drive vehicles still sought the utilitarian virtues of the Jeep CJ series, but consumers also were seeking more of the “creature comforts” found in passenger cars. The response was discontinuing the CJ series and introducing the 1987 Jeep Wrangler (YJ). Although the Wrangler shared the familiar open-body profile of the CJ-7, it contained few common parts with its famous predecessor. 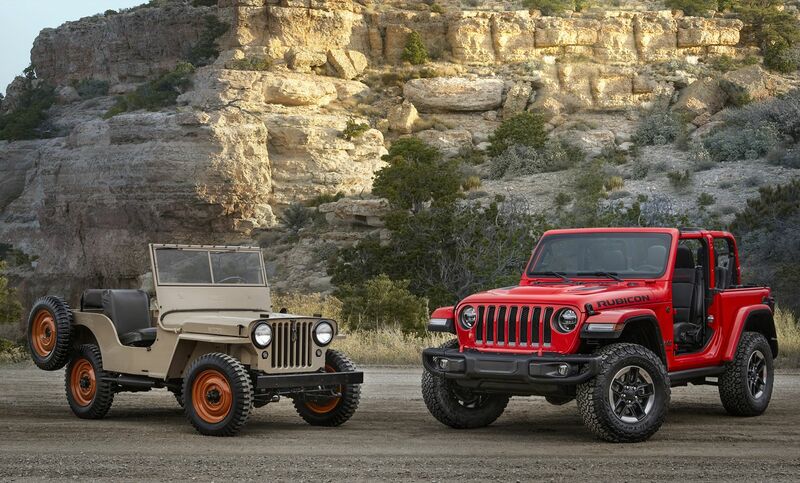 Mechanically, the Wrangler had more in common with the Cherokee than the CJ-7. The Wrangler YJ had square headlights, which was a first (and last) for this type of Jeep. The YJ model exceeded 630,000 units. On Aug. 5, 1987, about a year after the introduction of the Wrangler, AMC was sold to the Chrysler Corporation and the popular Jeep brand became a part of Chrysler’s Jeep/Eagle Division. The 1997 Jeep Wrangler (TJ) looked very similar to the CJ-7. Indeed its “heritage” look was quite deliberate, but the vehicle was very different from a mechanical standpoint. Nearly 80 percent of the vehicle parts were newly designed. The TJ used a four-link coil suspension, similar to the Jeep Grand Cherokee, and featured a new interior, including driver and passenger air bags. The TJ retained several classic Jeep features, such as round headlights, a fold-down windshield (first seen in 1940) and removable doors, as well as a choice of a soft top or removable hardtop. A factory-fitted sport bar was also standard. Enter the then-best-equipped Jeep ever – the 2003 Jeep Wrangler Rubicon. This vehicle earned the right to be called by the legendary trail name, as it was equipped with push-button-actuated locking front and rear Dana 44 axles, a 4:1 low-range transfer case, 32-inch tires and many more options not available on any production Jeep before it. In 2004, the Jeep Wrangler Unlimited was introduced — a longer-wheelbase Wrangler, featuring 13 inches more cargo room and two inches of additional second-row legroom. While maintaining the unmatched open-air fun and 4×4 capability of the original Jeep Wrangler, the Unlimited model offered more refined on-road comfort, as well as even more versatility. Building on the successful, original Jeep formula with an all-new frame, exterior and interior design, engine, and safety and convenience features, the JK delivered more capability, refinement, interior space and comfort, open-air fun, power, fuel efficiency and safety features. Featuring a one-of-a-kind, four-door open-air design, the JK Wrangler expanded the Jeep experience to new dimensions. With room for five adult passengers – a Wrangler first – and the most cargo space ever offered in a Wrangler, the Unlimited combines class-leading off-road capability with everyday practicality. A modern design that stays true to the original, the all-new Wrangler JL delivers even more capability and offers three advanced fuel-efficient powertrains, more open-air options, technology and safety features. A modern approach to an authentic design, with new exterior and interior styling, Wrangler JL builds on the Jeep brand’s rich history with heritage-inspired design cues and its iconic round headlamps and square tail lamps, which provide a distinctive Wrangler character. For the first time ever on Wrangler, the use of lightweight, high-strength aluminum doors, door hinges, hood, fenders and swing gate are utilized and helps reduce weight and boost fuel economy. Two gasoline and one diesel engine options will be available – two of which are turbocharged, another first for Wrangler. Both Wrangler two- and four-door models offer even more capability and everyday practicality, while delivering an unmatched open-air driving experience.